In this photo, she’s carrying it as she starts her march out of the cove. I wish I could say that she was carrying it voluntarily, but I cannot: the plastic was hooked securely on her lower bill. Thanks to Cee for her recent Cee’s Fun Foto Challenge: Good & Bad. It’s very GOOD that this Great Blue Heron did her part to remove that huge plastic bag from the cove at the lake. It’s looking very BAD, however, for the National Park Service and environmental science lately. Thanks to Ailsa for her Weekly Travel Theme: March. Yes, the Heron is female, and yes, she is starting to march away with the plastic bag, and so this is indeed a Woman’s March, albeit missing that signature hat. Thanks also once again to Stewart Moncton for the Wild Bird Wednesday prompt. Posted on January 26, 2017, in ardea herodias, Birds, Cee's Fun Foto Challenge, environmental protection, Great Blue Heron, Nature, plastic bags, postaday, Weekly Photo Challenge, Weekly Travel Themes, Wild Bird Wednesday, Wildlife Photography and tagged environmental protection, postaday, womens-march. Bookmark the permalink. 14 Comments. Thanks so much for playing along this week. Have a great weekend. Wonderful photos. All bird photos are favorites of mine! 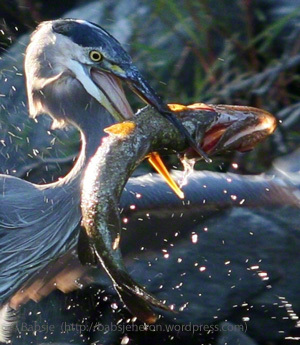 Love the heron photo!